Background: Somewhere along the line an infatuation with scooters turned into an obsession with motorcycles. Burnout from too many years coding web sites lead to a mad ride around the USA on a Ninja 250 in 2009. The results on the psyche were exceptional, but only served to fuel the fire, and initiate planning for The Next Big Trip. Experience with long distance rides. Unquenchable thirst for beautiful landscapes. Will do whatever it takes to get there. Can differentiate between you’re and your. 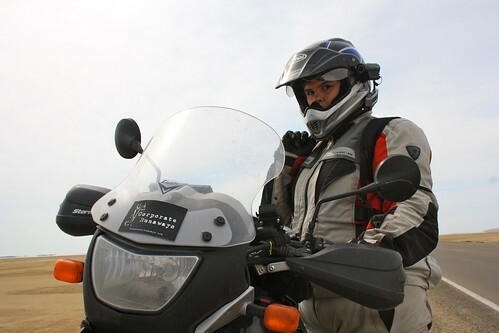 Background: A freelance writer who, upon moving in with Kay, discovered a hidden obsession with motorcycles. In April 2010 she got, and crashed, her first motorcycle. Repairing the bike and getting back on it started a love affair with all things motorcycle. Able to cook rice in a pot. Able to melt pot lid when attempting to cook rice. Willingness to sing loudly and off-key. Writes at approximately 2 billion wpm. An uncanny ability to understand instruction manuals. Background: A surplus dog from the South, Ben was relocated to a shelter in the North where Dachary fell in love with him, in spite of the fact that he was a nervous wreck that no-one else wanted. After years of work, he had become a fabulous, well-socialized, mostly-friendly dog. 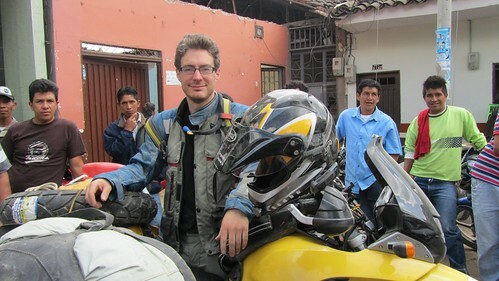 Upon returning from the Americas trip, Ben took time to re-adjust to having Dachary back, and it was decreed that he should henceforth travel with them by motorcycle. Ben is currently in training to become an Intern with Corporate Runaways. Background: Lita – formerly known as Sneads – was another surplus dog from the south. Shelter records indicate she started out in Alabama. Her history before becoming an intern at the age of 2 is unknown, although she displays an unexpected fondness for cart ladies and a dislike of children. She became an intern when Kay and Dachary were visiting the Northeast Animal Shelter, and the then Sneads barked at them every time they tried to leave the room where she was located. Ben had the final word on selecting her as an intern – he was waggy and interested in hanging out with her during a meet-and-greet – and her position was secured. RETIRED: Alas, Bandido’s adventuring days ended on 4/4/15. He will always be a beloved and valued former intern. Background: Bandido’s life started as a street dog in Puerto Rico, where he was hit by a car and his back left leg and foot badly broken. He was rescued and sent to the US, where Kay adopted him. Upon the return from the Americas trip, the Corporate Runaways discovered he had been “broken.” The dog-sitters had not handled his home guarding as instructed by Kay and Dachary, and ‘Dido had become defensive and had begun biting people. Over a year later, he has been mostly rehabilitated, but still hasn’t fully recovered. It was decreed that he must travel with the humans in order to prevent a relapse. Bandido is currently in training to become an Intern with Corporate Runaways.